It has been months that I have prepared this vegetable cutlet. It is one of my hubby's favourite. Though previously, I used to deep fry it oil, this time I tried baking it. Initially I was skeptical about baking, as I am still learning as a baker. Seeing a lot of bakers and their blogs I got inspired and decided to bake it. I was lucky! 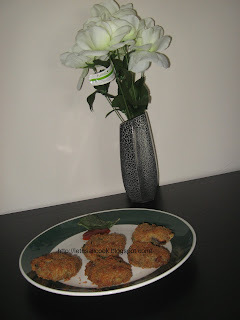 The Vegetable cutlet turned out to be very tasty and great looking. Oil for deep frying. If baking, you will need 2 tsp of oil to prepare the mixture. A thin mixture of 1 tbsp of all purpose flour and water. Pressure cook all the vegetables and chick peas till you get 3 hisses. Immediately release the pressure and remove the vegetables from the cooker. Separate the potato alone and peel and mash it in a bowl. Place all the other vegetables in a tissue paper and squeeze to remove excess water. In a Pan, add oil, cumin seeds and saute them. Now add ginger garlic paste and cashew and saute. Add the vegetables and mix well. Add chilli powder,turmeric powder,cumin and coriander powder and mix well. Now add salt. Saute them until the water is evaporated. Now add this mixture to the mashed potato along with finely chopped cilantro and mix well. Take small amount of this mixture and make it into a cutlet shape, it can be round, oval or heart shaped and dip it in the all purpose flour and water mixture and immediately coat them with bread crumbs. This step needs to be done very quick so that we can prevent the cutlets from absorbing more water. Preheat the over to 375 degree F and Place these cutlets in the baking pan for 15 -20mts. Now remove the pan and turn the cutlets and bake it for another 15 mts. Remove and serve hot with Chilli/Tomato sauce. In a Pan, add enough oil and deep fry them until they are brown. Serve hot with Chilli/Tomato sauce. Note: In either case, make sure that the cutlet mixture has less moisture it in. This will help in getting a crispy vegetable cutlet. As for the winner of $20 gift card, I will select the top 5 recipes ( The number may increase as I find many interesting recipes) and you all need to vote! These recipes will be selected based on the uniqueness and the amount of protein content and also originality. The voting poll will be open soon in my blog. Come back to get more details on the round up. A VERY BIG THANKS TO ALL OF YOU WHO HELPED ME MAKE THIS CONTEST A GREAT SUCCESS! I will be posting the topic for next month event asap. They sound yummy indeed so it's no wonder it has become your hubby's favourite. oh wow! baked cutlets are new to me! nice one!! nice cutlet sangeeth. thks for visiting my blog...the date banana shake is really very tasty I am sure u would enjoy it. I love these! Quick get that plate out before I finish them off! Baked cutlets something new to me. Hmm going to try out. I added u r blog to the list. Baked cutlets! that's a yummy idea! Oh my God!!! that's really a very big roundup!!! really u r too patient to do such a work!!! keep it up!